Semiconductors that supply useful gain at microwave frequencies can supply tons more gain at very low frequencies, where you don't want it. If you are not careful, you will see oscillations that prevent useful I-V measurements of such devices. Experimentation with low-pass filter elements (and sometimes resistive elements) can reduce or eliminate the oscillations. This is not something that requires a college education, it is all done seat-of-the-pants. If you are looking for advice on this topic, ask the oldest technician in your lab, not some empty-suit manager. One thing to remember is that oscillations only occur on three-terminal measurements. If you are just looking at diode characteristics, you have nothing to worry about. Unless you are looking at a diode with negative resistance... (more on that later). How do you know your device is oscillating? 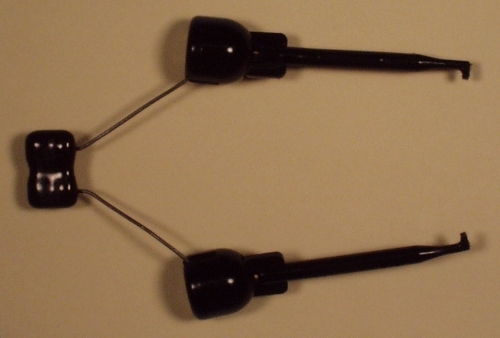 The I-V curves will jump around as you increase the swept voltage. And by wiggling the wires or just moving your hands, you can mysteriously change the curves. Below is an I-V curve of a part that is oscillating. What can you do about it? Chances are your microwave device won't fit in any of the transistor test fixtures that Tektronix supplies with all curve tracers. Someone in your microwave lab probably threw them out a million years ago. Instead, you'll use clip leads that plug into the banana jack inputs to the CT. Here's your first tip to avoid oscillations: use coax leads if your device is located any appreciable distance from the CT. You'll want the jacket of the coax to connected to the source (or emitter), and the inside to connect to the gate (or emitter). What you are doing is minimizing stray capacitance between the input and output terminals of your device. Just a few feet of wires in close proximity can create enough pico-Farads of feedback to really mess you up. Oscillations are happening at many times the frequency that the curve tracer is trying to take your data. You can employ low-pass filters to stabilize the measurement. Shunt capacitors between drain and source (base and emitter) often work well. However, if you put a large capacitor here, you will start to see "looping" in the curves. This is not a huge problem, if you want to read a specific IV point off of the curve, just average the two sides of the looped trace. You can get away with nano-Farads of capacitance without looping, but not micro-Farads. Series inductors on the drain connection can also work well. Here, you have to consider the series resistance of the inductor, if it is appreciable compared to what your are trying to measure, it will smear the IV curves out to the right. Choose an inductor with less than 0.1 ohm, and you will be OK for all but the largest devices. How do you connect these elements to your device? Often the easiest way is to install clip leads onto the capacitor or inductor that you want to use. 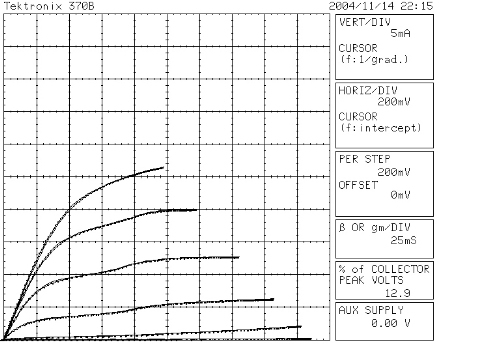 Below is a 5000 pF capacitor (.005 uF) with clip leads , you might find items such as this laying near your curve tracer. By clipping this capacitor across the drain terminal of the previously oscillating device, we were able to almost completely stabilize the part. Check out the "new" IV curves! Resistive elements can be employed on the gate (or base) terminal to control oscillations, but you have to consider a few things. A series resistor on gate connection of a voltage-controlled device is OK, keep it less than 1K. For a current-controlled device, don't use more than 50 ohms, or you might give the CT a hernia trying to shove current through it to your device. A parallel resistor on the gate of a MESFET is also OK, provided you don't exceed the output current capability of the curve tracer. You might be able to get down to 100 ohms here. There is no practical way to employ a resistor on the on the output terminal of a transistor, it will mess up the IV curves you are trying to measure. Just wanted to add a comment that there are a couple more schemes which are pertinent to making "DC" measurements of fast devices. One scheme is not necessarily very relevant to packaged devices, mind you. Stinking fast unpackaged HBT's DC characteristics can often be measured without oscillation through bias tees terminated on the RF arm, and microwave probes. This is a lot more expensive hardware than some of the seat of the pants tricks, but if you have stinking fast unpackaged HBTs in the lab, then you might just already have the microwave on-wafer probes, broad-band bias tees, and broad band terminations to do this. With power devices, this scheme has problems passing enough current through the tee, and the low frequency cutoff of the tee might be too high to adequately stabilize the transistor. On the topic of resistive element tricks, there is sometimes room to take a cue from Kelvin lead resistor measurements. With "semiconductor parameter analyzers" as opposed to more traditional curve tracers you have the flexibility to measure the drain/collector voltage at the transistor end of a resistor through which Id/Ic flows. Since series resistance won't affect the voltage measurement, now you can wrap resistors all around the output of your unstable transistor. 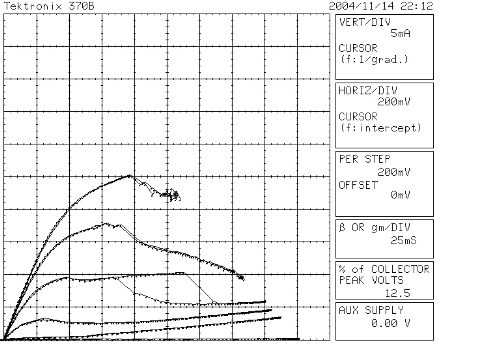 Of course, the current passing resistor looks a lot like the load line resistor in a conventional curve tracer. This topic is on a separate page.